Dotted with brownfield sites, Milwaukee’s Menomonee Valley is just one of the nation’s many damaged postindustrial corridors in need of revitalization. Through a design-build studio at the University of Wisconsin-Milwaukee, Barkow Leibinger Architects and Professor Kyle Talbott introduced a catalyst for the process of its rehabilitation. The studio created the Marcus Prize Pavilion, a permanent structure to serve as a meeting point and storage facility for volunteer gardeners working to restore the surrounding landscape. 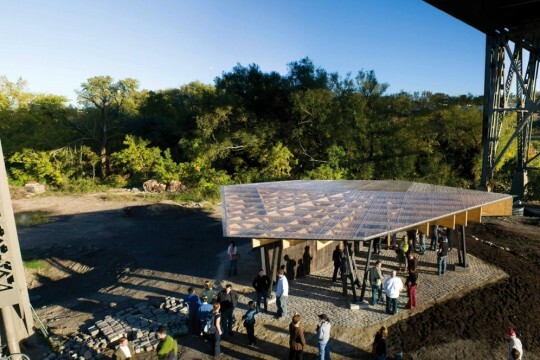 The pavilion’s design is inspired by local ecology, with a light, plywood-beamed roof mimicking the structure of leaves. It’s meant to be the first of a series of interventions to create a support network for the valley’s environmental reclamation.